Contrary to popular belief, most people (extrovert, introverts, sensors, intuitives) don’t really like small talk that much. I don’t think anyone’s heart skips a beat with talk about the next rainfall or how hot the sun has been shining (unless, perhaps, you’re a farmer or gardening expert). Different topics of conversation are naturally going to attract different people, and yet we spend SO much time talking about how “fine” our day was or what the latest celebrity gossip is about. Wouldn’t you like to save all that time and talk about things that actually interest you AND the person you’re speaking to? So without further ado, here’s what each personality type REALLY wants to talk about. ISTJs are more at home talking about practical realities than theoretical “what if’s”. That said, they aren’t exactly interested in talking about the minute details of daily life. They tend to have hobbies and interests that are varied and consuming. For some it’s mechanics, for others it’s reading, and others it’s sports. They enjoy it when people take the time to show an interest in their hobbies and interests. ISTJs tend to be “specialists” and learn all they can possibly find about their passion. Being able to speak in detail about their interests will light up their day. Keep in mind, ISTJs are very private people who will not immediately open up about their lives. They will feel uncomfortable if they’re rushed into discussing personal issues, emotions, or relationships. They also need plenty of time to reflect before talking or responding to a question. They will feel frustrated if they are rushed to make a decision, but once they do make up their minds they are usually very sure of themselves and their path. ISFJs are interested in talking about their plans, experiences, and relationships. They tend to have hobbies and projects that they’re working on and they enjoy discussing those; whether it be a craft they’re making or a new work endeavor. They enjoy philosophical conversations as long as it doesn’t turn into a debate; that can quickly turn them off. They like to have their lives organized and so they enjoy talking about how to create a more optimized environment for that. They also enjoy being confided in, and it means a lot when people ask them for advice about their relationships and plans. They can be very good listeners in this area and very empathetic and encouraging. As dominant Introverted Sensors, ISFJs enjoy recalling their favorite experiences and memories. Keep in mind, ISFJs are generally private and gentle individuals. They will feel uncomfortable if someone is too forceful, debative, or inquisitive of their personal lives. They need time to consider the details and reflect before making a decision, so being rushed to decide or respond quickly can frustrate them. They generally aren’t interested in debating things or arguing because they dislike conflict and also because they don’t see the point in debating theories that may have no realistic impact on their lives. ESTJs are inspired by conversations that focus on goals and plans for the future. They are extremely motivated, productive individuals and enjoy discussing their current hobbies, projects, and achievements. They also enjoy helping other people find efficient methods for achieving their own goals. They appreciate people who are assertive, confident, and looking to achieve something in life. They enjoy dealing with people who can handle their blunt, direct nature without getting offended by it. Coming up with action plans, giving logical advice, and discussing their hobbies and experiences are all fun for them. Keep in mind, ESTJs are very direct, blunt individuals. They are “tough nuts” and one must be willing to handle their clear, direct approach without feeling intimidated by it. They like it when people get to the point, don’t beat around the bush, and are prepared. They usually use simple, uncomplicated language and appreciate when others do the same. They also don’t appreciate people who “troll” or intentionally offend others or joke around when important discussions are being had. A sense of propriety is generally important to ESTJs. ESFJs enjoy conversations that revolve around getting to know people better and more intimately. They enjoy sharing their experiences, talking about plans for the future, or just laughing about funny occurrences or TV shows they’ve watched. They enjoy being confided in and asked for advice, and they also enjoy figuring out ways to make the world a better place, especially in their communities. They are usually relatively skilled at small talk, but they prefer it to lead to something more intimate and meaningful. Their goal at the end of a conversation is to have rapport and bonding; to be able to look at the other person and both be thinking “we should get together more often!”. Keep in mind, ESFJs are usually very polite and tactful people and appreciate that in others. They hate it when people “steamroll” over their values and feelings, or act condescending or patronizing to them. They are run by their values and appreciate conversation that focuses on self-improvement or bettering the world in some way. They enjoy precise, clear language and usually seem down-to-earth and appreciate that same quality in others. ISTPs like conversations that revolve around a practical purpose or else an exciting or enjoyable activity. They enjoy problem-solving, discussing adventures or opportunities, and swapping opinions on things like technology. Funny, hypothetical scenarios like “how would you survive a zombie apocalypse?” tend to be entertaining for them because it’s creative and lets them problem-solve in a low-pressure way. For ISTPs, having a casual, humorous approach is ideal. They tend to get frustrated talking with people who take themselves too seriously or can’t take a joke. Keep in mind, ISTPs are usually pretty reserved and private individuals. They will grow tired of conversations that are invasive or overly personal. And if your type of “problem solving” conversation revolves around constantly asking them for favors (“can you fix my computer?”, “can you fix my plumbing?”) then that will get frustrating as well. They don’t like it when people are pushy or rush them for a decision too quickly; they like to think things over before responding to questions. It’s important to have a laid-back, authentic, “live and let live” approach when talking with them. ISFPs enjoy conversation that revolves around their current passions and projects. Although they often have deep emotions and values, they are usually not comfortable talking about them unless they know someone very well. They can feel overwhelmed if someone is bombarding them with personal questions. Initially it’s a good idea to ask them about some specific activities or hobbies they have and explain any creative projects you’re working on as well. As they get to know you better they can enjoy more philosophical, intimate discussion but trust must be established first. They appreciate when other people confide in them or ask their opinions, and they appreciate when conversation revolves around a cause that is important to them (i.e., “helping animals”, “improving the environment”, etc,.). Keep in mind, ISFPs take their time to open up to new people. Try not to ask them too many questions at first or they may feel that they’re being interrogated. Also, try not to take yourself too seriously. ISFPs enjoy some friendly banter and joking around at the beginning of conversations and will get frustrated with anyone who seems patronizing. They can enjoy talking about deeper subjects, but if someone is talking about something with an air of superiority or just to “hear themselves talk” then they’ll be majorly turned off. Stay humble, authentic, and if possible have a practical application for what you’re talking about. ESTPs are very fond of action in their lives, so conversation that revolves around an activity or event tends to interest them. They enjoy talking about their current projects, their favorite games, music they like, food they enjoy, or any exciting opportunities that are on the horizon for them. They have a good sense of humor and appreciate the same in others; if someone takes themselves too seriously they might enjoy ribbing them or joking around to try to “loosen” them up. They love hearing about opportunities and exciting adventures they can partake in, whether it’s trying out a new restaurant or embarking on an entrepreneurial pursuit. They like to take risks and challenge themselves, so appealing to their sense of adventure is always a good idea. Keep in mind, ESTPs are extremely good at reading people. They are very aware of the body language that people are using (through their dominant Se) as well as the wants/desires of those people (through their tertiary Fe) so don’t try to pull anything over on them. Be authentic, “real”, and down-to-earth. They can enjoy deeper discussion, but generally they’re looking for something that has a practical application or a real-world purpose. Talking about “what if’s” just to talk about them can get boring for them. They also tend to use clear, direct language and like it when people can “get to the point” instead of rambling on and on for a long time. ESFPs are caring, generous, and adventurous individuals who love to connect with others over shared experiences and values. Conversations that pique their interest involve a new event or activity to pursue, something funny or entertaining that happened, or a project that might help someone in some way. They like their conversation to have a direct application and they like people who can use clear, concrete language. People who take themselves too seriously or seem patronizing or snobbish will quickly turn them off. They usually have a good sense of humor and appreciate this in others. Keep in mind, ESFPs are good-natured and easy-going individuals and will be quickly turned off by people who seem arrogant. They are also quick to spot authenticity or lack thereof, so sincerity is a must. While they tend to be outgoing people, they usually won’t divulge the intimate details of their personal lives or their deepest emotions unless they trust someone really well. It’s best not to pry into their personal lives unless they bring it up on their own and seem interested in discussing it. INTJs prefer to have conversations that revolve around big-picture concepts and possibilities/theories about the future. They are more interested in concepts and ideas than details, and will quickly tire of small talk or everyday subjects. They are interested in understanding the mysteries of the universe, philosophy, psychology, or any number of subjects that will broaden their perspective on life. They also enjoy discussing their goals and plans and strategies. They can go from being very direct in their speech (usually when problem-solving or discussing a strategy) to seeming vague, rambling, and imprecise. This is because when trying to pull from their intuition, they have to pull from a largely unconscious, inner world that is hard to explain in concrete words. They also tend to have very little interest in details, and may skip over them to get to the “main point”. Keep in mind, INTJs are very private individuals and will dislike being pried about their personal lives or emotions. They are really only interested in sharing their emotions or feelings with people really close to them, and on their own terms. They also will grow weary of gossip, small talk, and detailed discussion about daily activities. They are also extremely logical people, and will give direct, logical advice at times when other people may be looking for consolation and empathy. It’s important to be understanding of this and not get offended or frustrated about it. INFJs enjoy having conversations that revolve around big-picture concepts and possibilities/ideas that will help people. They tend to like thinking up creative solutions to complex problems or strategizing future implications for people. They like everything they do to have some kind of positive impact for people or to broaden their perspective on the meaning of life. They are always trying to figure out the “meaning of the universe” and are thus interested in topics like philosophy, psychology, and religion (as long as it’s not a heated debate). They also tend to enjoy being confided in and helping people with their personal problems or struggles. Keep in mind, INFJs need time to think things over before responding so people will need to be patient and not rush them to give feedback right away. They also are empathetic and sensitive to others, so it’s important for more direct people to think carefully before saying anything that might seem harshly critical, especially of someone dear to the INFJ. Finally, INFJs take a long time to form decisions, but once they do they are very sure of themselves and even stubborn. If someone is condescending or patronizing to them they will likely shut them out or maintain only a very aloof relationship with that person. ENTJs enjoy having conversations that revolve around goals, strategies, and big-picture concepts or ideas. They are very direct, proactive people who don’t like to “beat around the bush” or waste time on details. They appreciate people who think outside the box, have vision, and are confident and studied in their assertions. They like conversations to be open for debate and enjoy playing devil’s advocate, so be prepared! If you have a new theory you want to discuss, a big goal you want to achieve, or an insight into something related to the future then go ahead and bring this up. Keep in mind, ENTJs are extremely direct, blunt individuals. They don’t like sugarcoating things or wasting time on extraneous details. They are also extremely decisive, so it’s important to be aware of this when preparing for a conversation. Mulling things over and procrastinating will drive them crazy. They are also extremely logical people; if you want their advice on something personal, be prepared for quick, direct advice. If you just want empathy and/or consolation, you may be a little disappointed, although at times ENTJs can be very empathetic depending on their level of maturity. ENFJs enjoy finding out what inspires and motivates people. They enjoy sharing their passions with others and listening to people’s goals and dreams. They like helping their friends find strategic ways to meet their goals or they enjoy providing encouragement in their journey. They are very future-oriented and like to talk about where they see things going in the future; they also enjoy discussing theories, concepts, and self-improvement. ENFJs are always on a quest for personal growth and enjoy sharing their discoveries and helping other people achieve their own personal goals. They also like it when people confide in them and ask their advice about personal matters or their feelings. Keep in mind, ENFJs are very tactful, enthusiastic people. They really care about maintaining harmony and keeping morale up. Try not to be overly critical and definitely don’t dismiss their values in any way. Use good manners and be respectful. ENFJs are very decisive people usually, so if you’re wanting to explore the possibilities further try to bring up different perspectives and potential outcomes without overwhelming them with lots of details. INTPs enjoy discussing creative solutions to problems as well as theoretical possibilities and ideas. The important thing with INTPs is to take an interest in their current hobbies or fascinations. They are very eclectic people and what fascinates one may be dull to another. They are often voracious readers and fond of anything having to do with technology or big topics like science, psychology or philosophy. People who seem attentive (without prying) are always appreciated. They are big-picture, future-oriented people who love to discuss what could happen in the future or odd connections between different ideas. Keep in mind, INTPs apply a lot of deep analysis to all their ideas and statements. If you’re going to debate or argue a point with them make sure that you’ve done your research! They also dislike being rushed through their explanations or rushed to make a decision. INTPs are very careful about the accuracy of their words and will get frustrated if the person they’re talking to is pushing and prodding them for closure before they’re ready. 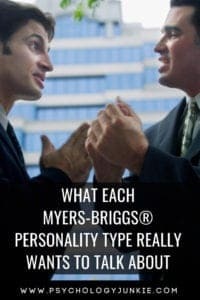 INTPs are also more impersonal than feeling types, so be aware that when they give critiques or feedback they may not be thinking about how it will affect someone emotionally. Try to be open-minded and understand that they are rarely trying to hurt someone’s feelings. INFPs enjoy conversations that focus on imaginative possibilities or the causes that interest them. They are usually not too fond of small talk, but would rather discuss their ideas, motivations, creative pursuits, or personal endeavors. They enjoy being confided in and empathizing with people, especially if those people will be attentive in return and not just dominate every conversation. They are often artistic and fond of books and stories; so discussing their favorite stories, poems, or songs is usually inspiring for them. In whatever you say, it’s vital to be sincere and kind. They will bristle at people who seem phony or who are overbearing or critical. Pay attention to where their values are and try to be open-minded and ask questions about those passions. For example, if they’re focused on getting plastics out of the oceans ask if they have any ideas of how more people could be convinced to stop using straws! Keep in mind, INFPs are very private about their emotions and personal lives unless they trust someone very deeply. Try not to pry or ask too many questions that might make them feel interrogated. They dislike small talk, but easing into deeper conversation by talking about music, books, movies, or projects can help to break the ice and then give them an opportunity to explain WHY they like those things (which branches off into more personal/deep topics). It’s especially important not to be directive, bossy, or critical with INFPs. They are very independent and individualistic and dislike being coerced or criticized, even if the person doing it feels like they’re doing it constructively. Be empathetic as much as possible. ENTPs are most interested in discussing ideas for the future, theoretical possibilities, and creative solutions to complex problems. They are big-picture people who are always looking forward and love to brainstorm the potential out of every scenario. They enjoy talking to people who seem open-minded, curious, and attentive. They like it when people ask questions, answer questions, and give them plenty of time to think things over and explore many angles and alternatives. ENTPs are generally interested in future opportunities, how to improve something and make it better, or the future and what they see happening in the next 10 or 20 years. Almost no subject is off-limits to an ENTP as long as it’s not boring, small-talk, or filled with excessive details. Keep in mind, ENTPs like to play with a lot of ideas and possibilities, but have a harder time sticking with just one or implementing it. Judging types can get frustrated with this and become exasperated. It’s important to let them explore their ideas and if a decision really needs to be made, try to remind them that almost any decision can be changed if necessary. Sensing types can get overwhelmed with all the theory and “what if” rabbit-trails that ENTPS go down and find their conversation impractical or unrealistic. It’s important to recognize that ENTPs are naturally good at seeing unusual connections and possibilities, and that it leads to many great innovations and unique ideas. ENFPs are most of all interested in exploring new ideas and possibilities for the future. They love to brainstorm or toss around unique and offbeat theories to see if there’s any relevance behind them. They also enjoy being confided in by their friends and listening and offering advice. They like conversations where lots of ideas are presented, where they’re given a lot of options to choose from, and where they are allowed to discuss and be inspired by the enormous wealth of potential that the future holds. They want to inspire people and be inspired themselves. They also like discussing out-of-the-box theories and even irreverent subjects in an effort to pin down the truth or find deeper understanding. Keep in mind, ENFPs are very compassionate and sensitive individuals, although they may not seem so sensitive at first glance because they are often so enthusiastic and open. They will dislike being around people who “troll” other people, who are domineering, or overly critical. It’s also important to remember that they use introverted feeling, and are somewhat private about their own emotions and personal lives. If you don’t know them very well it’s best not to pry into their personal lives too much, let them take the lead in this area. Let them be creative and spontaneous and try not to stifle their imagination or sense of wonder and possibility. Do you agree with this or do you have any other points you’d like to share? Let us know in the comments! Another excellent article,Susan! I LOVE what you had to say about my type( INFP). It was so on point, i felt touched 🙂 All of it is true for me. Now of course, a lot of it is true for people i know personally that are of the respective types. Especially ISFJs and ENFJs. My sister is ENFJ and i really get along with her well when we talk because we both love to talk about future projects and ideas (she’s always one to talk about spirituality and psychology in general).